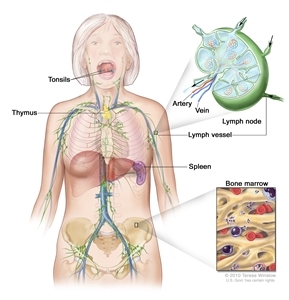 This summary will review issues related to anatomy and pathophysiology of lymphedema related to cancer, its clinical manifestations, diagnosis, and treatment. Primary (congenital) lymphedema and non-cancer-related lymphedema (e.g., recurrent cellulitis, connective tissue disease, and infection) will not be reviewed here. Historically, those at risk for lymphedema have been advised to avoid using the affected limb. The reasoning for this clinical advice seems to arise from the notion that the removal of lymph nodes altered the response of the affected area to inflammation, infection, injury, and trauma-therefore, it would be wise to avoid stressing the limb. However, exercise has a different effect on the body at lower doses than it does at higher doses; extreme exercise would promote inflammation and injury and should be avoided in patients at risk for lymphedema. By contrast, slowly progressive, carefully controlled increases in physiologic stress on a limb at risk for lymphedema may actually provide protection for real-life situations that require taxing that body part (e.g., carrying grocery bags, doing holiday shopping, or lifting a child). Therefore, physiologic evidence exists to question the historic advice to restrict use of the affected limb. Nonfatiguing exercises may induce sufficient muscle contraction to move lymph into terminal lymphangioles and reduce swelling. Aerobic exercise may also increase the tone of the sympathetic nervous system, which causes the lymph collector vessels to pump more vigorously. Multiple studies indicate that exercise, including upper-body exercise, is safe for women with breast cancer-related lymphedema. There is also evidence that slowly progressive weight lifting among women with previously diagnosed breast cancer-related lymphedema leads to a reduction by half of the likelihood of a clinically meaningful exacerbation of lymphedema (a flare-up) that requires treatment by a physical therapist. [Level of evidence: I] A group of 141 breast cancer survivors with lymphedema were randomly assigned to a twice-weekly, year-long weight-lifting intervention (N = 71) or to a wait-list comparison group (N = 70). The intervention started with 13 weeks of supervised training with little to no resistance; the amount of weight lifted was increased very gradually and only if there was no change in lymphedema symptoms or swelling. The participants all wore well-fitting, custom-made compression garments that were replaced 6 months into the intervention period. Women with breast cancer-related lymphedema should be guided to work with a certified fitness professional or physical therapist to learn the proper biomechanical form for upper-body weight-lifting exercises before undertaking this program on their own. (The specifics of the intervention are available to certified fitness professionals and physical therapists through the National Lymphedema Network.) Further research is needed to develop a version of this intervention that can be broadly disseminated. Intermittent external pneumatic compression may also provide additional improvement with lymphedema management when used adjunctively with decongestive lymphatic therapy. One small randomized trial of 23 women with new breast cancer-associated lymphedema found an additional significant volume reduction when compared with manual lymphatic drainage alone (45% vs. 26%). [Level of evidence: I] Similarly, improvements were also found in the maintenance phase of therapy. Concerns regarding the use of intermittent pneumatic compression include the optimum amount of pressure and treatment schedule and whether maintenance therapy is needed after the initial reduction in edema. [Level of evidence: I] There is a theoretical concern that pressures higher than 60 mmHg and long-term use may actually injure lymphatic vessels. The results of a small randomized trial have suggested that breast cancer-related lymphedema may improve with weight loss. [Level of evidence: I] The mechanism by which obesity may predispose to lymphedema is unclear, but proposed mechanisms include an increased risk of postoperative complications, including infection, reduced muscle pumping efficiency, and separation of lymphatic channels by subcutaneous fat. A larger, longer-term weight-loss intervention in cancer patients with lymphedema (including those with lower-extremity disease) is warranted to further explore weight loss for disease management. Check the list of NCI-supported cancer clinical trials for supportive and palliative care trials about lymphedema that are now accepting participants. The list of trials can be further narrowed by location, drug, intervention, and other criteria.